Fireworks are the centerpiece of Fourth of July celebrations around the country. Unfortunately, all too often those fun, carefree festivities can easily result in serious burns, other types of injuries and even in extreme cases, death. When an injury happens, the Edwards Law Firm’s committed personal injury lawyers in Tulsa can help you determine who is at fault: a property owner, the person who bought the fireworks or the manufacturer of the product. If you or someone you love was injured in a fireworks accident, do not hesitate to seek medical attention as soon as possible. Once you have bee treated for your injury, you should contact an experienced Tulsa burn injury attorney to find out if you have the legal option to bring a claim against the at-fault party. With the celebration of our Nations independence quickly approaching, it is important to understand the risks that fireworks pose so that you and your family can enjoy the show in the safest way possible. 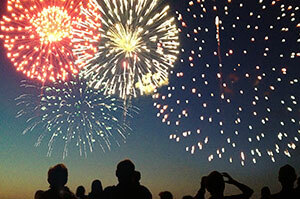 In 2013 there was an estimated 11,400 injuries related to fireworks. According to the U.S. Consumer Product Safety Commission (CPSC), that is a 31 percent jump in injuries when compared to the 8,700 injuries that were reported the previous year. The Commission also reports that 57 percent of fireworks injuries happened to men, and most resulted from firecrackers, sparklers, bottle rocks and Roman candles. The fact that most injuries were caused by smaller fireworks that the everyday person purchases makes sense considering that the CPSC estimates that only two percent of all injuries occur at professional shows. If your celebration leads to injury, our personal injury lawyers can help. We proudly represent injury victims in Texas, Oklahoma and Arkansas. Complete a Case Evaluation form to schedule a free consultation.